"The SC Series PMA Is A True Low RPM Power House!" "See 12,000 watts+ coming out of A 5.5kg PMA! A great accomplishment!" Capable of generating well over 12,000 Watts at speeds over 18,000 RPM. Great for charging BIG battery banks that are drained. Great for heavy amp loads! The higher the amp load the harder they work. 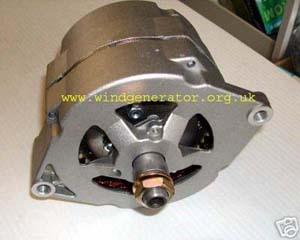 Perfect for building simple, inexpensive and dependable wind or water turbines. A put-up and forget design! Expect decades of dependable service life. Bi-rotational. Makes power when turned in either direction. Note: Clockwise is the preferred direction since the nut tends to stay on and it cools better! All weather rated. Rain, ice and weather proof electronics. D.C. output. Includes built in rectifier. 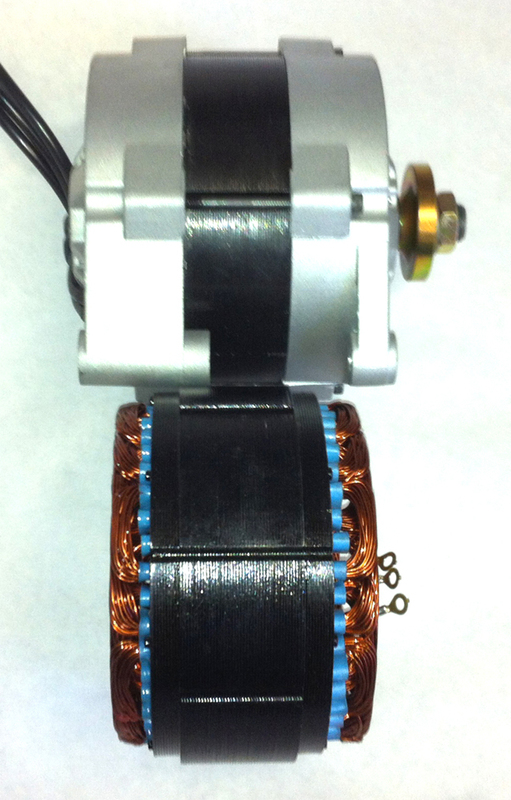 2.33 phase magnetic field spread for maximum efficiency +low cogging! 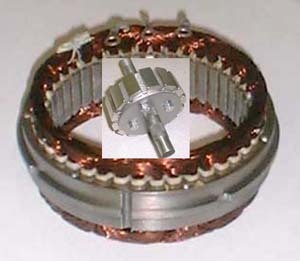 Heavy Duty coils and diodes. 14 powerful #42H Neodymium magnets. A LARGE extra heavy duty cooling fan must be used for all engine, hydro and or belt driven systems. Wind turbines usually have enough air circulation not to require a fan BUT you must determine this fact by testing and observation. Specify your series #PFK cooling fan kit option at the time of your PMA order. Our PMA's are not fail safe!!! If you over load them they can burn out!!! You as the designer must watch carefully for signs of over heating. We will not warranty any fried PMA's!!!!! !Â HEAT WARNINGS:IF you are pulling over 500 Watts without a cooling fan your PMA it will over heat! Fan kits are very important to have on ALL high amp applications!!! !--- Keeping your PMA's cooled, fused and under reasonable loads is the operators full responsibility. Monitor your PMA for excessive heating in all experimental machinery! Maximum PMA's operating temperature is 350 F. for 100% duty cycle. No warrantees on ANY burned out PMA's! They are sold in good working condition and you have to keep them cool and never over loaded regarding amperage draw.Â A PMA RUNNING SLOW WHILE DRAWING A FULL AMP LOAD IS A DEAD PMA!Here is guide to help you choose the right PMA and keep it cool via the correct RPM V. AMPS coefficientThese figures must then be matched to the power curves. This total calculation mustbe donecorrectly or you may find yourself burning up a few PMA's as part of your learning curve. (Expensive lessons for the inexperienced!!!!!!! !All Sales Final. )Â POWER DRAW CHART0 to 300 Watts - Required RPM for proper cooling fan operation = 0 to 300 rpm +300 to 800 Watts - Required RPM for proper cooling fan operation = 1400 rpm +800 to 1500 Watts - Required RPM for proper cooling fan operation = 2500 rpm +1500 to 2500 Watts - Required RPM for proper cooling fan operation = 3700 rpm +2500 to 5000 Watts - Required RPM for proper cooling fan operation = 5500 rpm +5000 to 7000 Watts - Required RPM for proper cooling fan operation = 8500 rpm +7000 to 10,000 Watts - Required RPM for proper cooling fan operation = 11,000 rpm +10,000 to 14,000 Watts - Required RPM for proper cooling fan operation = 18,000 rpm +14,000 to 16,000 Watts - Required RPM for proper cooling fan operation = 25,000 rpm +Â Following these figure are ONLY a guide and is not a guarantees cool operation since your amp load can still be to extreme. Don't pull more amperage then they can handle. If you burn one up you own it!!! No warranties on burned up PMA's!!! All Sales Final. If you are an amateur and do not understand electrical windings and how much heat they can take please don't buy one of our PMA's. If you are experienced watch for over heating and be careful.Â Tech notes: Do not attempt to use a pulley smaller than 60MM" - The belt tension required to keep the belt from slipping on a smaller pulley will cause excessive pressure on the front bearing shorting its life.Â 5 to 8 HP engines are the most popular choice for people trying to achieve maximum results from their PMA's when utilizing internal combustion engines. 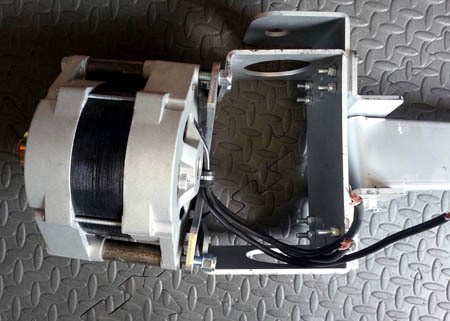 A 5 to 6" engine pulley works good on 4 to 10 horse power engines and a 6 to 9" drive pulley has reportedly worked good for 10 and 18 horse power engines.